Sideswiped is a YouTube Originals movie, which is all set to premiere on July 25, 2018! This YouTube film is all about today’s “Tinder culture” and the ways people have adopted a new style of going on dates and meeting their forever afters! Carly Craig produced the hilarious movie, and she also plays the lead role of a woman in her mid-30s looking to settle down with the right man! Initially called Swipe Right, Sideswiped is a YouTube Originals movie that you can watch online on as part of YouTube’s new original movies lineup. Get to know the plot of this star-studded laugh fest before the official premiere, which you can enjoy in the comfort of your own home! Olivia (Carly Craig) is a 35-year-old single woman, who landed in a situation after saying “no” too many times in the past. Her sister, Jayne (Chelsea Frei) and her Internet-savvy mom, Mary (Rosanna Arquette), help her set up a Tinder profile, which is when things take a hilarious turn! The star-studded movie has guest appearances by some of the best in comedy, like Jason Sudeikis, Thomas Lennon, Christopher McDonald, and many others. In the Sideswiped trailer, Tyler Posey and Charles Michael Davis can also be seen, making the movie all the more interesting to book the couch or your bed for the weekend! American Housewife star Carly Craig plays the lead role of Olivia. Craig is Mandy Moore’s stepsister, who is also known for her work in The Three Stooges. She has also appeared in the movies, Dumb and Dumber To and Hall Pass, as well as TV shows like Burning Love and Hello Ladies. Craig’s mother, Marz Olson Moore, is a flight attendant at American Airlines. 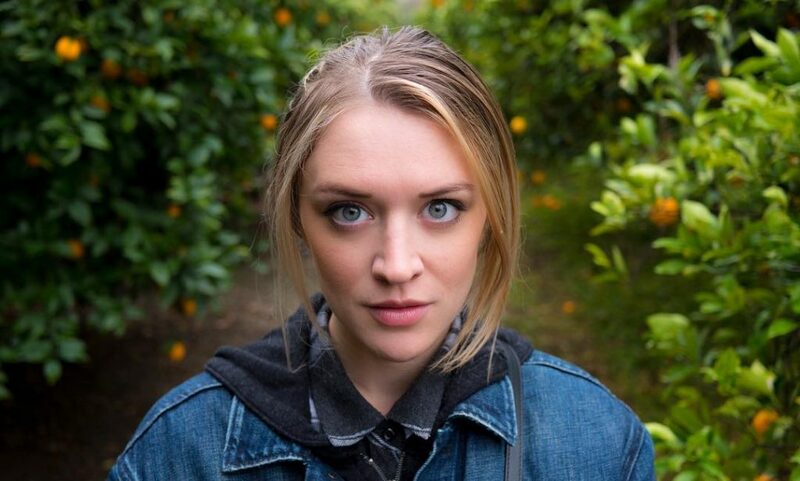 Olivia’s married sister, who sets up the Tinder account, is played by Chelsea Frei. She is best known for Hostess and has also appeared in Wolf and Audition. The actress even does bits of comedy on her Instagram account. Frei is a hilarious woman and comedy comes naturally to her, which is also why she is perfect to play the role of her quirky and outspoken sister! Emmy Award-nominated actress Rosanna Arquette plays the role of Olivia’s mother in Sideswiped. She is best known for her work in Desperately Seeking Susan (1985), The Big Blue (1988), Pulp Fiction (1994), and Searching for Debra Winger (2002). Between 2006 and 2007, she was a part to the ABC show, What About Brian? Arquette has also appeared in The Executioner’s Song and has won a BAFTA Award for her role alongside Madonna in Desperately Seeking Susan. She used to be married to John Sidel, and the couple shares a daughter named Zoe Bleu Sidel. Arquette has been married four times, and her current husband is investment banker Todd Morgan. If you are wondering how to watch Sideswiped or when the movie is set to release, then mark your calendars for July 25, 2018. The movie is a YouTube Originals film and is available on YouTube Premium, which requires an account with the video-streaming service. The service is free for one month, after which it will cost $11.99 per month. Or you can buy a family pack for up to six family members for $17.99 per month. YouTube Premium provides an ad-free experience, much like competitors Netflix and Hulu. With the subscription, you can enjoy watching many other YouTube Originals, as well as download exclusive videos. So, if you haven’t done so yet, make sure you to subscribe to YouTube Premium to watch Sideswiped!